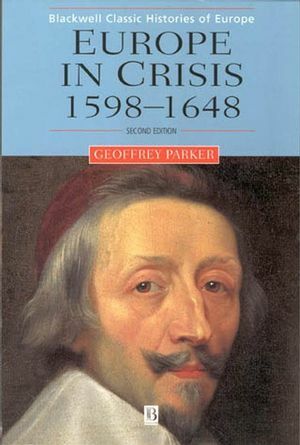 In the new edition of this classic book, Geoffrey Parker draws on material from all over Europe to provide an authoritative and exciting account of the eventful first half of the seventeenth century. Geoffrey Parker is Andreas Dorpalen Professor of History at Ohio State University. He previously taught at Yale University (1993-96) and at the University of Illinois at Urbana-Champaign where he was department chair from 1989 to 1991. He also taught at the Universities of Cambridge and St Andrews in Britain and at the University of British Columbia, Vancouver, in Canada. His many books include The Military Revolution. Military innovation and the rise of the West, 1500-1800 (1988), the winner of two book prizes, Philip II (1978), now in its third edition, The Grand Strategy of Philip II (1998) The Dutch Revolt (revised edition, 1984), and The Thirty Years' War (revised edition, 1997). 1. European Society and the Economy. An Economy on the Edge of Crisis. 2. European Society and the State. 3. The Times of Troubles in the East, 1593-1618. The Austrian Habsburgs and the Turks. The Vasas and their Enemies. 4. Armed Neutrality in the West, 1598-1618. 5. The Apogee of Habsburg Imperialism, 1618-1629. Rise and Fall of a Coalition. France and the Cold War for Italy. 6. The Defeat of the Habsburgs, 1629-1635. 7. War and Revolution, 1635-1648. The Crisis of the Spanish Monarchy. The End of the Eighty Years' War. The End of the Thirty Years' War. 8. The Culture of Post-Renaissance Europe. The Culture of Everyday Life. "Geoffrey Parker's book is characteristically lucid, lively and vigorous. In its updated form it makes the best introduction to the period I know." "This is no ordinary textbook, but one that can be read and enjoyed again and again. Thanks to the breadth of the author's knowledge of the primary and secondary material, even scholars of the period will continually find new nuggets of information and fresh insights to set them thinking." "This textbook is witty, lively and provocative. Unlike so many anglophone historians, Professor Parker thinks Moscow and Mecklenburg are as interesting as Madrid or Marseilles: this is a genuinely European history of Europe." "The new edition [is] equally instructive, enjoyable, enlightening and essential; it thoroughly deserves the appellation of 'modern classic' and will long remain a standard text"
An authoritative and exciting account of the eventful first half of the seventeenth century. Gives an account of the revolution, civil war and complex international conflicts which brought many states to the edge of collapse in the 1640s. Covers the struggle of the Habsburgs with France and the Dutch Republic; the rivalry of Sweden, Denmark, Russia and Poland for control of the Baltic, and the confrontation between the Austrian Habsburgs and their subjects which escalated into the Thirty Years&apos; War. The new edition has been revised throughout and includes an updated bibliography.